Marine grade stainless steel long link chain in lengths up to a maximum of 50 metres. Stainless steel chain in A4, AISI 316 grade, available in a wide range of sizes from 1.5mm to 20mm thickness. 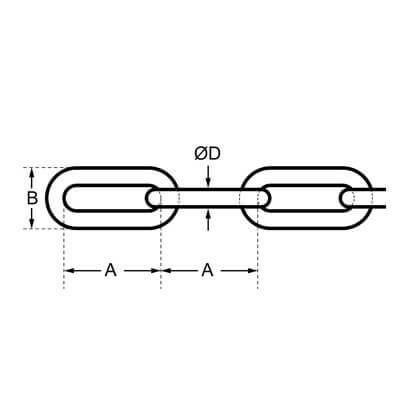 Stainless Steel Chain - Design and dimensions according to DIN 763. Please note 2mm and 3mm chain measure and form is to DIN 5685. This high quality long link chain can be purchased in multiples of 1 metre. all good. thankâ€‹ you for the efficiency. Good product and will buy from them again. Just what we needed. Exactly as described. As described and cheapest around. Good product at a good price with excellent service. Good service and well made product. Good quality stainless steel, smooth welds. High quality welding with a very good finish. 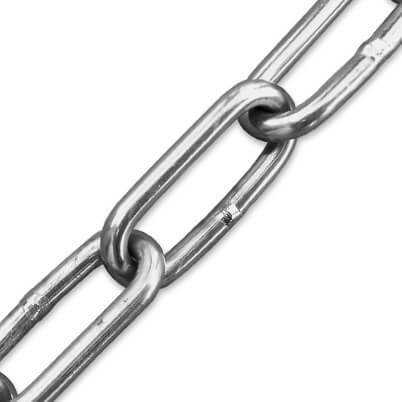 Marine grade stainless steel chain - smooth shiny links, looks good. Looks good quality but not tested the strength yet. Very reasonable prices. Bought for a job, and is exactly as described. Good quality stainless steel. Good quality, and just as described. I needed this chain in a hurry. It was a good price and it arrived promptly. Impressive service. Long link chain was just what I required and good quality. What I wanted and as described.